The smallest model in ELAC’s Carina series, the BS243.4 ($1200/pair) represents a departure from Andrew Jones’ other designs that feature a concentric tweeter/midrange driver in that it combines a folded ribbon HF unit with a 5.25″ aluminum-cone woofer. A reflex design, its port fires downward from the bottom of the enclosure with a slot formed between the base and a plate underneath it. This should make the speaker easier to place in a room where it can’t be used well away from the wall behind it. 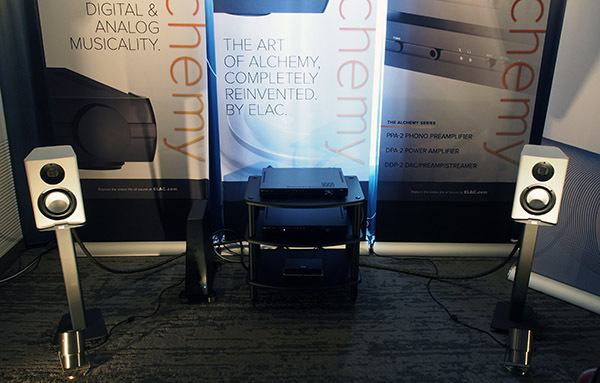 Driven by an Audio Alchemy DDP-2 preamp/DAC/streamer ($2499) and DPA-2 amplifier ($1499), with Shunyata power conditioning and Wireworld Eclipse 7 interconnects and speaker cables, the Carinas produced amazing bass definition and extension from an unidentified techno “love song” and the bass guitar on Aaron Neville’s “Ain’t No Sunshine” was boom-free, with excellent definition.